Moose is one of venison-lovers' favorite cut of venison, and everyone should try it at least once. Its gamey flavor is less pronounced, and although the muscle is larger and denser than other venison, with slow cooking, it's tender and tasty. Take the moose roast out of the refrigerator 1 hour before cooking. Liberally season the roast with kosher salt and freshly ground pepper. Heat the olive oil in a large skillet over medium-high heat, and brown the roast on all sides. Turn the roast with tongs, holding it against the skillet to ensure even browning. Transfer the roast to the slow-cooker. Add butter to the skillet over medium heat. When it stops foaming, add the onions and sprinkle the salt and sugar over them. Cover the skillet for 10 minutes, so the onions begin to soften. Remove the cover, and cook, frequently stirring, until the onions caramelize to golden-brown, about 12 to 15 minutes. Sprinkle the flour over the onions and mix well to coat them. Cook 2 more minutes as the flour browns, pour in the beef stock and red wine, and deglaze the skillet, stirring up any browned bits. Bring to a low boil over medium-high heat, and cook for 2 minutes more. 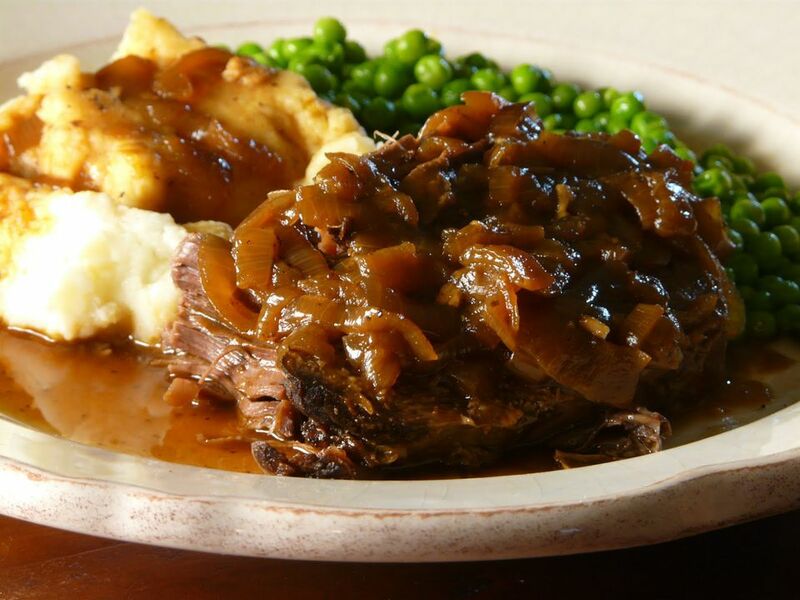 Carefully transfer the hot onions and gravy to the slow cooker, pouring it around and on top of the moose roast. Nestle the bay leaves in the gravy, cover, and cook on low for 8 hours until the meat is very tender. Check occasionally to make sure there is enough liquid, and add more beef stock if needed. When the moose is done, take it out of the slow cooker. Pour the onions and gravy into a large saucepan and heat to boiling. Lower to medium, and allow the gravy to reduce and thicken. Slice the meat, spoon some of the onions and sauce over the sliced moose, and serve the remaining sauce on the side.